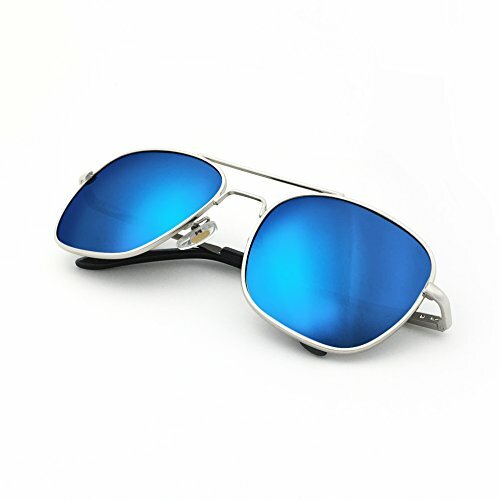 J+S Premium Military Style Classic Aviator Sunglasses, Polarized, 100% UV protection (Medium Square Frame - Silver Frame/Blue Mirror Square Lens) | What Should I Say? J+S Premium Military Style Classic Square Aviator Sunglasses Polarized and 100% UV protection - protect your eyes without compromising on style, comfort and safety. POLARIZED LENS - specialized multi layer lens designed to filter and block over 99.96% of glare - J+S Polarized lenses blocks out intense horizontal reflections (glare) by having vertically oriented filter layer embedded in the lens, providing maximum comfort and improved visibility. These lens are are tough, lightweight, scratch resistant, and have high optical clarity (distortion free, clear vision), making them an excellent choice for general outdoor and water sports activities. HIGH QUALITY FRAME - This classic round tortoise frame is made with sturdy polycarnonate frame that is light weight yet strong and durable. Spring loaded temples allows for comfortable fitting for both large and small heads, male or female. 100% RISK FREE PURCHASE - All J+S Sunglasses comes with a 1 year warranty on frames and lens as well as a 30 Day Money Back Guarantee when purchased from authorized dealers. So if you are not completely happy with your purchase for whatever reason, let us know and we'll take care of you.